To test the deflection of the uniform 400N/m beam the 600N boy exerts a pull of P42N on the rope. The distance between the rope and the support at A is P43 metres. 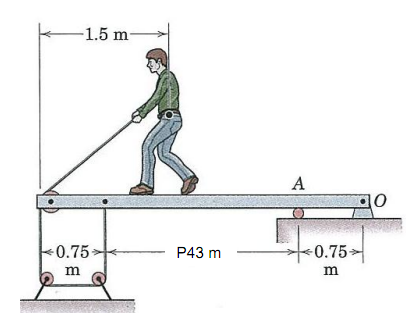 Assume the pulleys are frictionless and the CoG of the boy is 1.5m from the end of the beam. Determine the vertical reaction force on the pin at O. Is a sewing needle magnetic or non magnetic? Answer:- When you purchase it in the store it isn't magnetized but if you rub it with a magnet it becomes magnetic. Write down the differential form of Poynting theorem. What is the significance of Poynting vector? A device which changes light energy into electrical energy is known as photoelectric cell. It is also known as photocell or electric eye. Atoms and molecules, what is atom? Biot law, what is the biot law give the mathmatical description. what is the biot law give the mathmatical description.